The Gamesson Harvard pool table is an excellent indoor table, ideal for family use within the home or any other indoor environment. 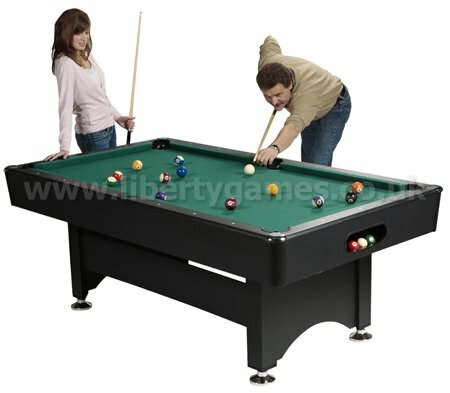 It features an automatic ball return system, which makes it easier to re-start the game and also gives it the authentic pool playing experience. The table has a traditional look with hidden pockets and provides a sturdy base to play on. The legs support individual levellers to ensure that the surface will be flat at all times. It is also lightweight enough to move around if necessary. Your order will be delivered by a two-man team to your front door. Please provide your phone number and email address with your order, so the delivery team can contact you to arrange a date and time. Delivery times may be slightly extended for addresses in Scotland and Devon. Redelivery charges apply in the case of failed deliveries. Please ensure that the team have appropriate access for the delivery.